How about a retro review? We had one last week with Klonoa: Empire of Dreams, so let's continue this platformer-themed retro review trend with Jak and Daxter: The Precursor Legacy. If you don't want to bust out and dust off the ol' PlayStation 2, you can plop down the cash for the Jak and Daxter Collection, an HD compendium of all three major PS2 Jak games. Of course, the first will always be my favorite! Ready to Get Jak'd Up?! Naughty Dog is one of the PlayStation brand's most proficient developers. 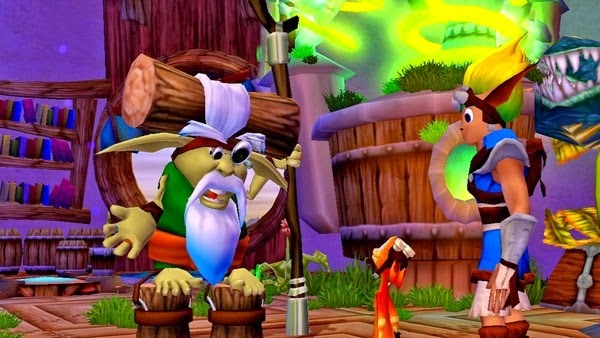 While nowadays they craft experiences meant to be compared to and rival Hollywood, their past projects include multiple platforming games such as Crash Bandicoot, and the subject of this review, Jak and Daxter. 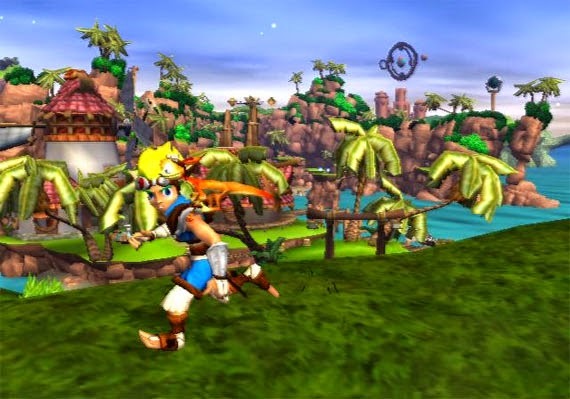 Before the series went off into The Simpsons' Poochie the Dog territory with Jak II, with its unnecessary focus on narrative in a platformer and new "attitude", the original Jak and Daxter was meant to be a bright and cheery new platforming franchise akin to games like Super Mario 64 and Banjo-Kazooie. Not only is it the best the series has to offer but a great platformer in its own right, Jak and Daxter: The Precursor Legacy is one of Naughty Dog's finest titles to date. Going against the wishes and warnings of Samos the Sage, who Jak and his loudmouthed pal Daxter live with in Sandover Village, the pair head to the mysterious and incredibly dangerous Misty Island. Hiding behind a rock, they catch wind of a plan from two figures being told to an army of Lurkers, foul beasts that don't take kindly to trespassers. After the villains have vamoosed, Jak and Daxter near a pool of Dark Eco, a hazardous liquid to touch. Unfortunately, Daxter falls into the pool, and when he comes out he takes the form of an ottsel, that is a combination of an otter and a weasel. When the duo return to Sandover Village and receive their deserved scolding, Samos the Sage advises the two to trek to Gol Acheron, a sage of Dark Eco who might be the only person who can return Daxter to his original form. "What the $%#% did you guys do!?" Jak and Daxter: The Precursor Legacy is a product of the nineties era of 3D platformers, despite being released in 2001. The focus is on exploring large interconnected worlds in order to gather various important collectibles through platforming and puzzle challenges. You control Jak, with the always-wisecracking Daxter in tow on his back. The typical platformer arsenal is represented and accounted for-- you have your double jump, spin attack, glide attack, among many other helpful moves to progress through the game. Jak controls well, although his jumps aren't as impressive as say, competition like Mario, for example. 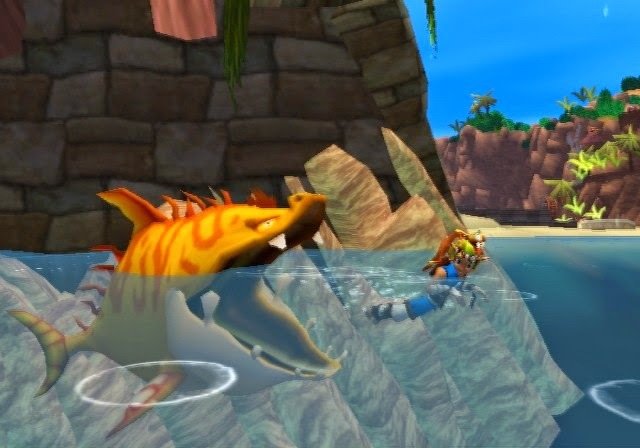 However, there's no denying that moving Jak around and occasionally smacking enemies feels very nice and responsive, so in that essence, Jak is like Mario. However, Jak can have his powers heightened for a limited time with interactions to various types of Eco energy. Green Eco energy grants Jak full health; while Blue Eco energy augments Jak's speed, ability to pick up nearby objects, and also turns on various machinery; and lastly Red and Yellow Eco energies boosts Jak's strength and allows him to shoot beams from his fist respectively. 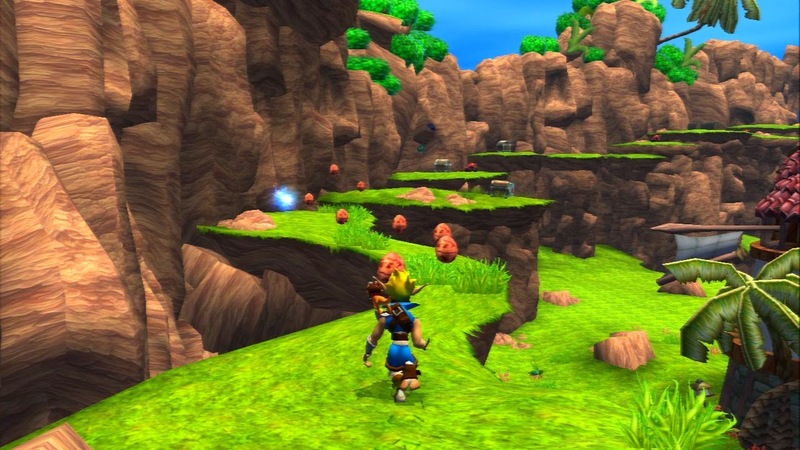 Although Jak can only put up with getting hit three times before it's lights out (and a snide remark from Daxter who stands over Jak's KO'd face), there's a healthy amount of checkpoints to be found, so it's rare to be forced to make up a lot of ground, saving players from a hassle most of the time. Or become fish food and lose a life instantly! Power Cells, of which there are 101 within the game's multitude of worlds, are the major collectible of Jak and Daxter. They are the collectible similar to the Power Stars of Super Mario 64, the Jiggies of Banjo-Kazooie, and the Golden Bananas of Donkey Kong 64. These are received through traditional platforming means (i.e. make it an obstacle course full of platforming peril), as well as through trading Precursor Orbs, the currency of the series, to numerous NPC's within the many worlds of the game. 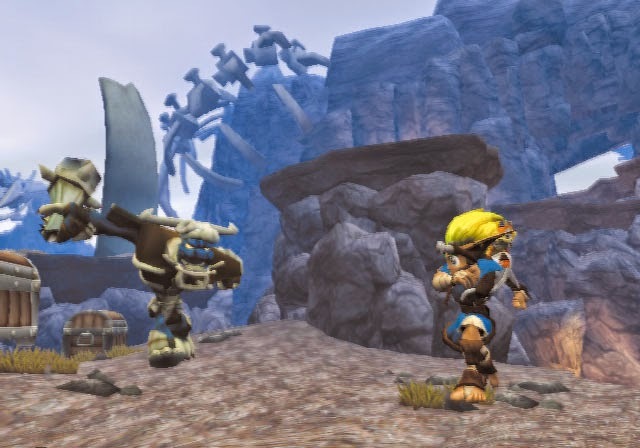 Much like the games it is modeled after, Jak and Daxter: The Precursor Legacy requires player to collect a certain number of Power Cells in order to progress at some points within the game. like Jiggies are to Banjo and Kazooie. Jak and Daxter: The Precursor Legacy isn't a very long game, but its 10-12 hours of content will make most players happy, especially compared to the amount of time it takes to beat some more modern games with a higher price tag that release these days. Collecting all of the Power Cells takes a certain degree of skill, and finding all of the Precursor Orbs in every area of the game makes for even more longevity. this narrow cliff side path like a boss! As for the presentation, Jak and Daxter may be an early PS2 title, but it certainly didn't look or run the part. I don't mean that in a negative way either. The graphical gods at Naughty Dog crafted a seriously well performing product. While the game itself may look visually unimpressive, how the actual game runs is nothing short of amazing. There's no loading times to speak of, next to no fog in expansive areas, allowing you to easily see across long distances, and the transitions between worlds are seamless. The sound is less inspired. Don't get me wrong-- the voice work is top notch, if not excessively Saturday morning cartoon-like, but the music is highly forgettable and did little to engage me as a listener. It's not horrid by any means, but it's also not fantastic either. It's just there. Play Misty Island for me. 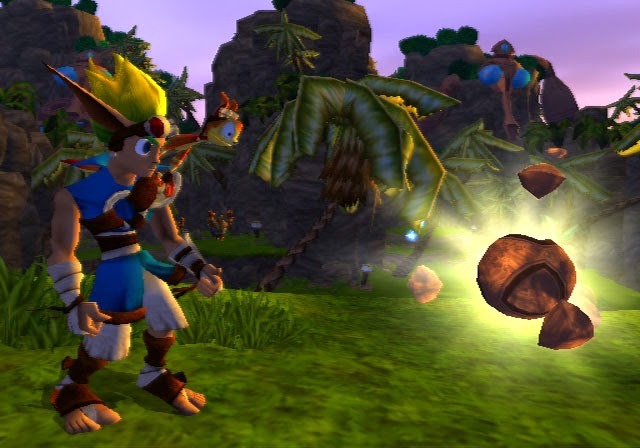 Jak and Daxter: The Precursor Legacy was a promising start to a new PlayStation franchise. It's a shame Naughty Dog went a different direction with the series than I, as well as many others, would have liked. That said, the platforming is solid, the levels are well made, the humor is abundant, and the technical polish is immense. 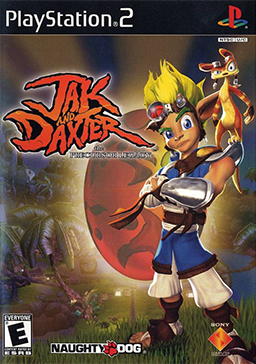 Jak and Daxter's first foray into gaming as well as Naughty Dog's first attempt at developing a PlayStation 2 game both were successful if not a tad long in tooth by today's standards.